A construction site can be a dangerous place. There's a lot going on, much of it inherently risky, and the situation is often best described as "controlled chaos." You do your best to be a safe and productive employee. You take all of the necessary precautions and look out for your co-workers. But you can do everything right and still suffer a catastrophic personal injury while on the job. Our firm represents those hurt on the job in construction accidents as the result of negligence from a third party. We will investigate your accident, determine its cause and pursue liability from the responsible parties. If you live in or around Redondo Beach, California and need an experienced construction accident lawyer, please call Kirtland & Packard, LLP today at 310-536-1000 to schedule your complimentary consultation. One of the common misconceptions regarding construction site accidents is that they are all handled through workers' compensation. People think that if they get hurt at work, they can't sue - they have to file for workers' comp. This isn't quite accurate, though it is generally true that a workplace injury with no outside actors involved is handled through workers' comp. In other words, if you're hurt at the workplace and no third parties played a role, you likely won't be able to sue. Construction sites are a bit more complicated, however. There are "third parties" everywhere. Heavy vehicle traffic is constant. Electricians, outside carpenters, a whole range of contractors who are not directly associated with the employee or employer who still play a significant role in the construction of a new building. If you're hurt as a result of negligence or misconduct from a third party, you can pursue a personal injury claim against that party. At Kirtland & Packard, our construction accident attorneys help victims with these claims. A personal injury lawsuit is different than workers’ compensation in several regards, not the least of which is it can include compensation for pain and suffering. Even if you qualify for workers’ compensation, it is often best to discuss your claim with a personal injury attorney to determine which course of action makes the most sense for the circumstance. OSHA’s Fatal Four are the leading causes of death on construction sites, but death is not always their result. In fact, the National Safety Council reports there were 310,000 preventable injuries in the field of construction that required medical attention in 2016, the latest year for which data is available. This makes the field of construction the third most most likely to result in injuries to workers that require medical attention. 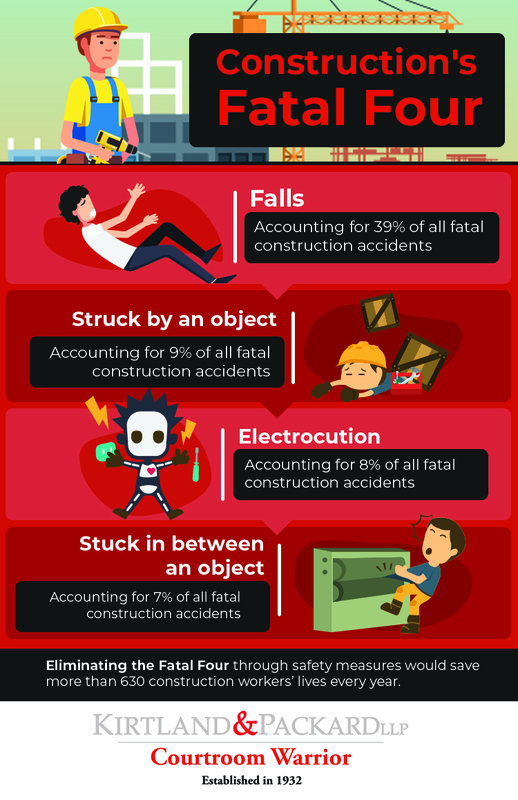 Construction remains the leader for injuries that result in death. Finding the true cause of your accident and resulting injury requires going deeper and pursuing liability wherever it might lead. Our construction accident lawyers are unafraid to pursue the compensation you deserve, even if liability lies on the shoulder of a powerful, wealthy organization or corporation. If you want to speak with our construction accident lawyers about your case, please call Kirtland & Packard, LLP today at 310-536-1000 for a complimentary case review. We serve injured construction workers and their families living throughout the South Bay area including Torrance, Manhattan Beach, and Gardenia from our Redondo Beach office. If your injury has made travel impossible, one of our attorneys can visit you for your obligation and cost-free consultation.